'High service tax will hit Indian start-ups quite badly'. 'We have to think globally and behave globally'. 'India is finally moving beyond IT services destination'. Image: Anand Chandrasekharan and his wife, Ashwini Ashokan. Photograph: Sreeram Selvaraj. 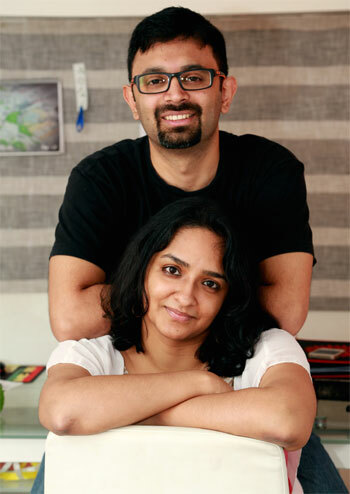 After living in the United States for around 15 years, Anand Chandrasekharan, a neuro-scientist and his wife, Ashwini Ashokan, a product designer decided to come back to India and start their own company. 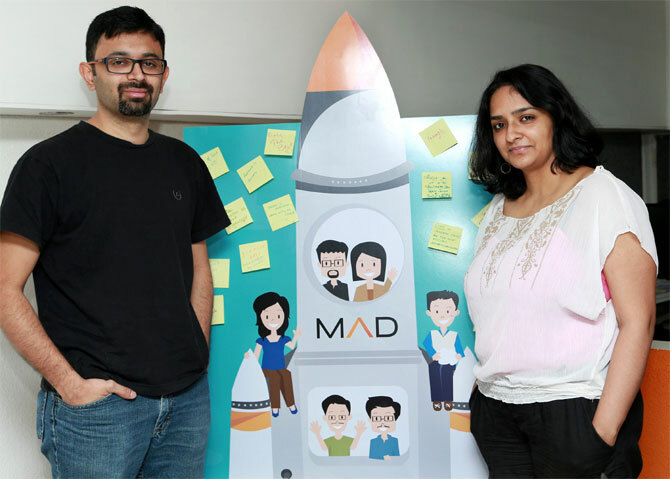 Mad Street Den, the start-up working in the field of artificial intelligence, attracted so much attention from investors from the time it was launched in 2013 that the couple are delighted to be back in India. After studying at the Indian Institute of Technology, Madras, Anand went on to complete his post-Doc at Stanford University while Ashwini went to Carnegie Melon for Masters in Product Design. At Stanford, Anand was part of the team that built Neurogrid, a circuit board consisting 16 neuro-core chips that can simulate 1 million neurons and billions of synaptic connections. While Ashwini joined the Intel Labs as the designer turned mobile innovation lead, Anand joined a start-up first and then became a consultant experimenting on AI. Just a few months after MSD was launched, the couple raised $1.5 million from Bangalore based Exfinity Technology Fund and Delhi-based GrowX Ventures. Exfinity Fund is promoted by people like T V Mohandas Pai, Deepak Ghaisas, Girish Paranjpe and Balakrishnan V.
MSD has an eight-member team in Chennai and one employee in their newly opened Bay Area office. In an interview with Shobha Warrier/Rediff.com, Chandrasekharan, the chief technology officer of Mad Street Den says he wants to do what he is doing now for the rest of his life, and the couple want to make MSD the one-stop AI company in the world. You left Silicon Valley - the best place for entrepreneurs - and came back to India. Why? Our plan was to do things differently from other start-ups, we wanted to make a platform. We wanted the freedom to explore and we knew it was difficult to convince a funding agency, in the US, on what we had in mind. We wanted to bring AI to the mainstream and experiment. Silicon Valley is an amazing place but it is high-strung and if you get into the eco system, you can’t hide. Things move fast in the Valley but we wanted to move at our own pace. We thought a little away from the frontline would give us the freedom to experiment. So, we moved to Bangalore in February 2013 as it was said to be the start-up hub of the world but it was disastrous for us. (Ashwini moved as an employee of Intel Labs first while Anand decided to experiment independently). We were experimenting and we needed resources though we must have invested around $100,000. We were competing with high-profile start-ups like Flipkart as far as hiring and attracting resources were concerned. It took us 9 months to launch our start-up, as AI is everything and nothing. Our first plan was to enter the gaming world. 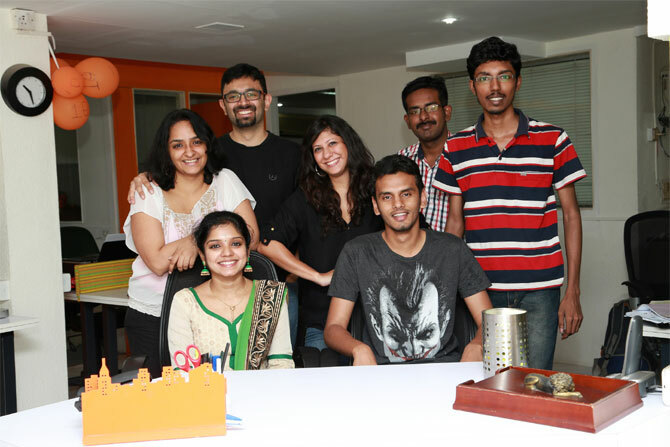 As things didn’t work out in Bangalore, in December 2013, we moved to Chennai. Was launching your company in Chennai easy? We are from this city, and things started falling in place very soon. We got people from the best institutions in India like the IIT and Vellore Institute of Technology. Why did you decide to name your start-up, MAD Street Den? MAD means Mind-abled Device and we wanted it be like a den where things get created. That is why our office is in a den! It has been very good and many people came on board and we could raise $1.5 million within a few months of starting the company. In fact, we came here to be in a stealth mode but we couldn’t. Was it difficult to raise so much money so fast? There is immense excitement among investors on start-ups, you speak to one venture capitalist and the word spreads. We went to one investment meet and the word spread. At that time, we were only in the idea mode with limited prototypes and our product was not even in the market. Is it not a good situation for a start-up? It is but we wanted to hide and experiment for a while. We were not looking to raise money at that time but everything happened quite fast. We were super excited but nervous too. Thankfully, our product came out in 6 months. We have come out with a new product, for the first time in the world. The good thing was, our tech actually worked and the word spread. Was money not important for your start-up? We didn’t need the money in the early stages as we were experimenting. Anyway, the investors were opening doors and bringing customers for us. So, there was value in their investment. With investors' money in our kitty, we are now in a position to scale faster. The office in the Bay Area is just that. Tell us about your product.. The entire AI platform is called MAD Stack, and we include eight different verticals mostly centred around e-commerce and analytics. One of this is Visual Search, which falls under the category object recognition. With this app, you can take a photograph of an attire and instantly find it online with recommendations, as per your liking, and that is the visual match. AI brings intelligence in the process of choosing. Our application also helps understand what the person is thinking through facial expressions and gestures. Analytics help companies analyse their customers and their behaviour. They need not rely on what they say about the products but can analyse from their expressions. This can be useful to advertising companies, research companies, and marketing groups. The government also has earmarked money for start-ups…. There is lot of money for start-ups but there are also many start-ups out there, which are investment starved. There are two groups and if you are in a particular industry, money finds you. We feel two extremes happening. Do you feel there are enough exciting ideas and investors in the market? If you look at the top $25billion companies in the world, three are Indian. We have had some runaway successes. Even investors in the Silicon Valley are going crazy about what is happening in India. Google Ventures is bringing money to India. India is an exciting place to be in right now. How do you rate the ecosystem for start-ups in India now? In the next 2-3 years, this is going to be the place. If you want to have a start up, India is the best place to be in. India is finally moving beyond IT services destination. Also, Indian companies are on a buying spree, ever outside the country. The maturity Indian companies have achieved can be gauged by the fact that they are buying American and European companies. Then the consumer market is also erupting after a long time. We are happy that we came back to India. Image: The Mad Street Den team. Photograph: Sreeram Selvaraj. Now that the finance minister has earmarked Rs 1,000 crore for start-ups, do you think the Budget will have a positive effect on more fresh entrepreneurs? This is the first time any government has spoken about and set aside a fund for start-ups though we do not know what will happen to the money eventually. The other day Prime Minister Narendra Modi said at a Nasscom function that the only reason why the tech ecosystem has succeeded in India was because the government had nothing to do with it. He was spot on. But I am quite upset about the service tax going up and more items coming under service tax. That will hit start-ups quite badly. Your application caters to online shopping. How mature is the online market in India? It is not as mature as the western market but it is huge and growing everyday. In the West, there is lot of deep engagement, however, it is only a matter of time when Indian online market also matures. Does it help to be a husband-wife team? It helps a lot. In fact, we feel it has helped both our marriage and company, though we fight a lot more. MSD has brought us closer personally. What would you tell those aspiring entrepreneurs who want to come to India and start a company? We would say, come. We expect many more Indians coming back to the country to start companies. We wouldn’t be surprised if people from other countries too come to India to start up. We see quite a few of them in Bangalore. The greatness about Bay Area is the cultural diversity that you see and experience. You find people from all over the world starting companies there. We see that happening in India. We don’t see any borders between countries now. We have to think globally and behave globally.